Only a few hours are left for the San Sebastian festivities to begin, in a year where the Tamborradas in the Diaspora are playing a special role. Yesterday, they received well-deserved recognition by Donostia’s Town Hall and the DSS2016 at an event that took place at the San Telmo Museum. There, Tamborradas in Necochea, Madrid, Buenos Aires, Bahia Blanca, Mexico and Barcelona were mentioned but the tribute was extended to all, big and small, that have been taking place around the world for years this Donostian style of celebrating. Donostia-San Sebastian. Donostia’s Tow Hall and the DSS2016 Foundation welcomed Tamborradas from Donostia at an event that took place at the San Telmo Museum. There was a special role played by Tamborradas at Basque clubs in the Diaspora that were paid a special tribute, for all of their years of spreading the sounds of MaestroSarriegi and the Donostia festivities throughout the world. Representatives of Tamborradas participated in the emotional event: Jose Maria Arana from the Madrid Basque club Tamborrada, and Xabier Zubillaga form the Tamborrada at the Necochea Argentina Basque club. Arana will go out in Madrid tonight where he will participate in the traditional dinner the night before and will join in the Tamborrada at midnight. “This year we will experience it with special emotion,” he assured. During the tribute the following Tamborradas were mentioned: Euskal Etxea in Madrid, the Necochea Basque club, Laurak Bat in Buenos Aires, the Union Vasca in Bahia Blanca, the Mexico Euskal Etxea, and the Euskal Etxea in Barcelona. But in addition to these, the recognition was extended to all of the Tamborradas in the Diaspora, both bit and small, veteran and new. Zorionak to them all! 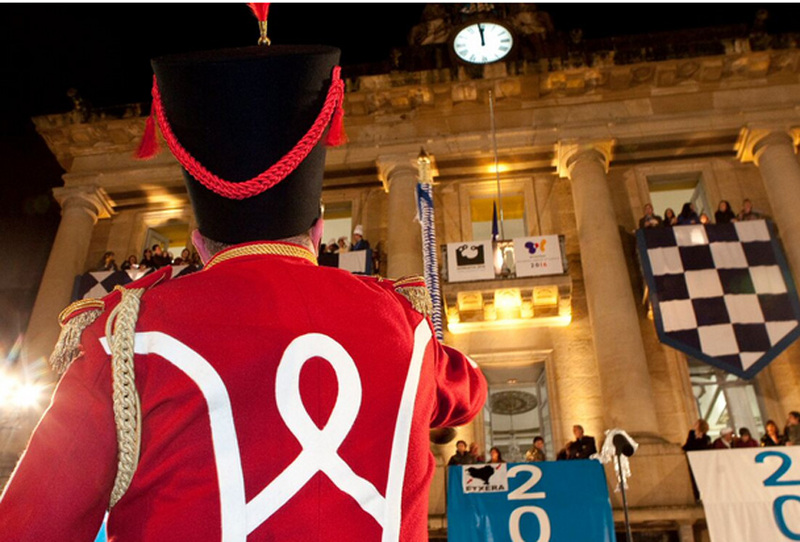 In addition, the Tamborrada also marks the beginning of the Donostia San Sebastian 2016 celebration. Beginning at midnight through the 24th, several events, and activities are planned. More information here.